California law (PRC 4291) generally requires owners and lessees of structures located in areas with flammable vegetation to reduce vegetation within 100 feet of the structures. This area around structures is part of what is called "defensible space," which also includes areas along emergency access routes and other places where wildfire fuel should be reduced to protect lives and property in the event of wildfire. Download CAL FIRE's "General Guidelines for Creating Defensible Space" (CAL FIRE's Guidelines) for a detailed explanation of how to create the minimum defensible space required by law. CAL FIRE's Guidelines encourage communities to create community-wide defensible space. The FSCMC can help you and your neighbors accomplish that goal. See our grants page for information on how the FSCMC can help. The following California Fire Alliance videos help explain the importance of defensible space and how to create and maintain it. For lists of wildfire safe and unsafe plants click here. The following CAL FIRE video shows in time lapse what it means to reduce wildfire fuels along roads to help enable their safe use for evacuations and for emergency vehicle access, during a wildfire. The following video from the Black Forest Fire in Colorado in 2013 shows how defensible space was used by the Colorado Springs Fire Department to help save a home. Need help creating defensible space? The following list is provided as a courtesy only, by the Pebble Beach Community Services District and Cypress and Carmel Highlands Fire Protection Districts. The list does not indicate a preference for one business over the other. These businesses voluntarily submitted their names to a fire department. Before hiring any business you should do your own due diligence by validating active contractor and business licenses and insurance, and get a quote prior to commencing any work. In addition to reducing vegetation, you can help protect your structures by modifying their construction and maintaining them to reduce the likelihood they will ignite during a wildfire. Following are links to information on how to modify structures to reduce ignitability during wildfires, and more. http://www.disastersafety.org/wildfire has succinct information on how to modify different parts of your structures to help reduce their ignitability. UC Davis paper "Home Survival in Wildfire-Prone Areas: Building Materials and Design Considerations." University of California's "Builder's Wildfire Mitigation Guide website." The Firewise Communities website has much information on all aspects of how you can make your home safer from wildfires. The Insurance Institute for Business and Home Safety has prepared area-specific brochures on retrofitting structures for wildfire safety, including a brochure for Southern California (10 MB). After the devastating 2009 Black Saturday fires, Australia's Country Fire Authority prepared a paper on retrofitting homes for wildfire. Note that this paper may contain recommendations that do not conform with California building codes. For new construction, see California's building code for wildfire areas, which can also provide insights on how existing construction may be improved. If you are think your home is sufficiently prepared and constructed to survive wildfires, you might watch an Australian Broadcasting Company video with the story of a survivor of the Black Saturday fires in Australia, Steve from Wandong, whose home was built with wildfires in mind, but was lost. 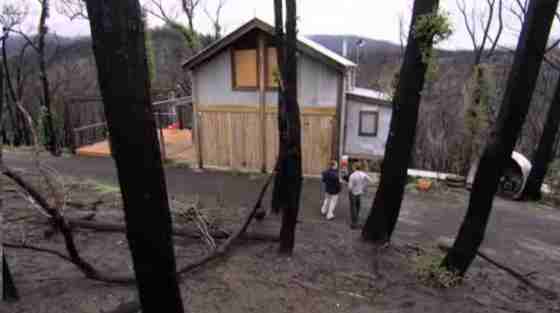 In the video Steve describes how his home was constructed, his experience at the house as the fire burned, and tells changes he is making as he rebuilds. Burning embers and firebrands are a primary source of structure ignition during wildfires. Burning embers can drift in heated air currents far ahead of an advancing wildfire front and are capable of blowing almost anywhere. The following video shows highlights of simulated wildfire ember production during tests conducted at the Insurance Institute for Business & Home Safety's multi-peril research center in South Carolina. The video shows a near life-size home with different types of construction being subjected to live embers driven by the IBHS's fan system. You can use the information in this video to learn about and correct some of the vulnerable aspects of the construction of your home and other structures. A website on the Australian Black Saturday fires has a video showing how unusual measures taken by a father and son saved their home, which was surrounded by fire and otherwise would likely have not survived. Click on the image below to be taken to the video titled "Knowing The Enemy" (advance the video to 5 minutes and 27 seconds to go to the discussion on how their home survived). It is important to understand that CAL FIRE does not support the concept of "stay and defend," and does not recommend it. However all fire authorities acknowledge that conditions may be such that residents have no other option.